New Mexico Tech serves the state and beyond through education, research, and service, focused in science, technology, engineering, and mathematics. Involved faculties educate a diverse student body in rigorous and collaborative programs, preparing scientists and engineers for the future. NM Tech innovative and interdisciplinary research expands the reach of humanity's knowledge and capabilities. Researchers, faculty, and students work together to solve real world problems. NM Tech's economic development and technology transfer benefit the economy of the state and create opportunities for success. New Mexico Tech aspires to be a preeminent community of scholars dedicated to research, education, and innovation—advancing science, technology, engineering, and mathematics—to meet the challenges of tomorrow. We will drive innovation and education through transdisciplinary collaborations. New Mexico Tech's local selection committee sought to commission artwork that represents the courses of study offered at New Mexico Tech and the student use of the Joseph A. Fidel Student Services Center. Shan Shan Sheng was born in Shanghai, moved to the United States in 1982 and currently resides in San Francisco. Sheng is an artist whose universal messages can be appreciated anywhere in the world. 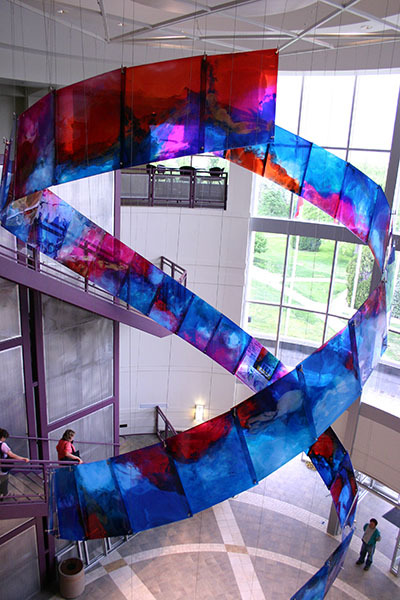 In her 25 years as a professional artist, most of her work is in the public art field. She has now completed over 30 large-scale projects in the states of California, Arizona, Massachusetts, Florida, New Mexico, Utah, Texas, Oklahoma and the cities of Chicago, Miami, Denver, Nashville, Charlotte and Cleveland as well as the international cities of Shanghai, Beijing, Taipei, Hong Kong, London and Venice. Sheng's spiro sculpture entitled "Rhythms pf Growth & Learning" reflects the environment and dichotomy of student and academic life at New Mexico Tech. The suspended cold casting glass sculpture winds down from the ceiling in the front atrium of Joseph A. Fidel Student Services Center. Eight of the 53 panels feature detailed images of knowledge, quotations from scientists and philosophers, mathematical formulas and scientific equations, representing the branches of science and technology. The dichotomy of a student's life is represented through two twisting glass elements. One twisting element represents a student's personal life and the other represents the academic life. The engagement of the two pieces is typical of a student's day to day activities as they progress towards graduation. From different perspectives the light passes through the twisting sculptures, an illusion of progress with an inviting and energized force is cascade on to the student population moving in and out of the Joseph A. Fidel Student Services Center.